Because I don’t think that I’ve ever been more scared in my life than when the rearview mirror flipped at me. And it happened a lot. The backseat is a special place to a kid. Once you’re out of a carseat you feel a whole new level of independence. You’re going places WITH your parents, but they’re not holding your hand. You’ve got your own little personal space and enjoy that a piece of the car is yours. All yours. Until your little brother invades it anyway. And then the backseat is no longer a place of solitude and respite, it’s a WARZONE. An invasion of your side of the car cannot be ignored. Retaliation must be swift and it must be severe. And so that’s what you do. You push, you shove, you hit, you scoot violently sideways toward your adversary until your seatbelt clicker rams into your hip and the belt snaps tight against your neck, which only makes you angrier. That’s when your angry whispers become a growling, bitter, gripe fest. But just as soon as the words leave your mouth you know the mistake you’ve made and your eyes dart to the front of the car, wondering if you’ve attracted anyone’s attention. And as you see his hand moving toward the mirror you know you’ve made a mistake. Because this time a simple “Y’all keep it down back there” isn’t going to be enough. He isn’t going to just fuss, he’s going to look you in the eye while he does it. And somehow that makes it all worse. I don’t know what it is about hearing that little button click on the rearview mirror that strikes fear into the hearts of children, but it does. Or at least it did. Because you know what I realized on a recent vacation? 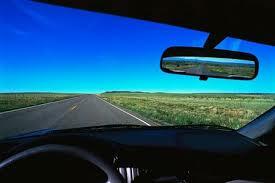 Rearview mirrors don’t have a clicky-flip-switch anymore! Now, if you wanna look your kids in the eye while careening around sharp mountain turns at 80mph you don’t get a satisfying CLICK when you grab the mirror. You just adjust the mirror. How anticlimactic is that? I can tell you from first hand experience that it’s not very scary. Grabbing the mirror and adjusting it down, then up, then sideways, then back down just a little, then back up because your kids are suddenly sitting bolt upright, isn’t awe inspiring….it’s just lame. But after you go through all that and you set them straight, what then? I’ll tell you what then….You have to readjust the mirror. And how does that feel? I’ll tell you how that feels….Imagine that you’re a military commander shouting at your new recruits for having muddy boots and unpressed uniforms, but when you turn to walk away you trip and fall down a step (not a flight of stairs, you just stumble and do that weird stutter-step-I’m-gonna-run-and-flail-my-arms-and-try-not-to-fall-but-I-do-anyway thing on one tiny little step and then fall down anyway). Or imagine being the President and giving a press conference about how lazy and selfish the other party is and how they’re ruining our country, only to turn and walk into a sliding glass door. THAT’S how it feels to have to readjust your mirror after fussing at your kids. The world is worse off for the lack of the rearview mirror clicky switch thing. Children run amuck in the back seat, parents have to choose between seeing traffic behind them and scaring the bejeebers out of their kids, precious seconds of shouting-at-your-kids time is wasted…..All because of a lack of the clicky switch thing. Bring it back, Big Auto. Bring it back, because if you don’t-The terrorists win. ← Suicide–Why it’s so dangerous to our salvation.